King Richard II (1367-1400), son of Edward the Black Prince, was crowned at age ten, with the regency of a council headed by John of Gaunt. His achievements when an adolescent in negotiating an end to the Peasants' Rebellion, 1381, were not lived up to when he ruled the country as king. He alienated Parliament, was deposed in 1399 and died (probably murdered) a prisoner at Pontefract Castle. This collection of historical documents, a chronicle of English kings and rules for activities at the royal court was made during Richard's reign. It is possible that the king had it made for his ally, Thomas de Mowbray. 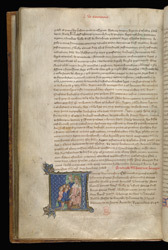 Its miniatures resemble closely others surviving in manuscripts decorated for the monks of Westminster Abbey as well as a few linked to Richard II, who apparently was an outstanding royal patron of painters. The Wilton Diptych (in the National Gallery, London), probably his personal devotional shrine, represents him before English royal saints adoring the Virgin and Child. 'The manner of paying homage to the king' is the subject of the document beginning on this page. Its first letter is historiated (bears a picture) with the seated, guarded king given a hunting bird by four kneeling nobles, their eyes downcast. Allies of Richard II are named in it. Taken together with the preceding documents in the manuscript, many of which are favourable treaties of his Plantagenet forebears, this document could be seen as part of a court 'bonding' to affirm loyalties as well as assert royal authority in this period of increasingly deep trouble for Richard, who was unable to cope with the profound upheavals of the late 14th century.